How about telling me which site is "this site"? How about an option to see what company I "have not chosen to trust"? How about more options than Yes and No to an ambiguous question? I'd like to ask some clarifying questions. 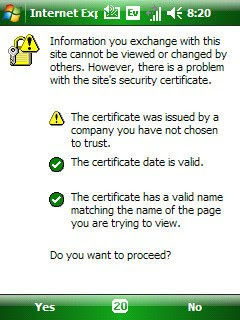 How about giving me an option to view the certificate information before making a decision to proceed? A warning without sufficient information to enable me to make an intelligent decision isn't very helpful.